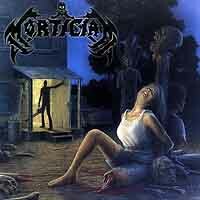 It hardly seems like you can read a review of MORTICIAN without seeing the adjective "brutal". Well I am here to announce that "brutal" is officially too wimpy a term to apply to the new MORTICIAN album. The band have topped (or in their case bottomed) even themselves. Everything is even more low tuned than ever before. The fast parts are faster and the slow parts are heavier. They have even kept the horror movie samples to a minimum (by their standards) thus allowing the full impact of the music to be felt without constant interruption (my biggest gripe about their last couple of discs) although for my money they could bag them all together... There are almost 30 tunes on this disc and each and every one of them sets a new standard for total death metal extremity.